Russia, Belarus, Ukraine and Kazakhstan plan quadrilateral meetings to develop a coordinated position on the second period of the Kyoto Protocol. The countries are unhappy with the amendment adopted at the last climate meeting of the parties in Doha not to exceed the emission level of 2008 – 2010 during 2013 -2020, on the average. Environmental NGOs call to stop considering climate agreement as a mechanism to benefit, to refuse from the “hot air” and to take stronger commitments to reduce emissions. In Doha, the countries – members to the climate convention - voted for extension of the Kyoto Protocol by 2020. Also, agreed were legal requirements that allow extension of the Kyoto Protocol. Under the new rules, countries committed to the obligations are permitted to transfer units from CDM and JI projects contained in their registries from the first period of the Kyoto Protocol, but not more than 2.5% of the set quantity for the country of the acquisition in the first commitment period. Clause G in the “Kyoto” amendment requires countries with commitments under the Kyoto Protocol not to exceed the emission level of 2008 – 2010 during 2013 -2020, on the average. This fact has put Ukraine, Belarus and Kazakhstan in a very difficult position. 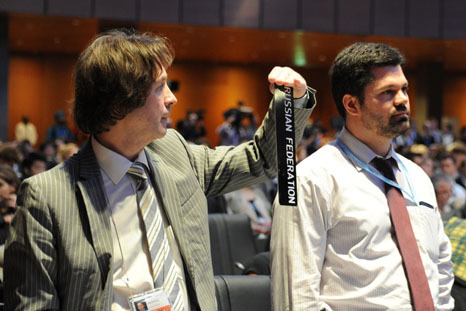 The four "post-soviet" powers are dissatisfied with the amendment. According to Yury Yarashevich, the Head of Economic Cooperation and Sustainable Development Department of the Ministry of Foreign Affairs of Belarus, the adopted rules "leave no room for the growth of the economies in transition, and are inconsistent with the principles of the Convention." According to the official, the Doha decision blocks incentives and prevents the use of market instruments. It is interesting to note that, back in December of last year, officials of Belarus and Ukraine declared their firm intention to access the KP2. Their current rhetoric almost completely copies the position of Russia, who says that the Kyoto Protocol has lost its sense. Ukraine could theoretically compensate for its excessive emissions in 2013-2020 by quotas left over from the first commitment period. However, the demand of Ukraine on the full, unlimited transfer of "hot air" causes protests by European states. In their opinion, it is contrary to the agreed Kyoto Protocol. Economic growth and transition to coal to replace expensive Russian gas create additional obstacles to participation of Ukraine in the climate agreement. For their solution, this country needs to strengthen the goal to reduce emissions, rapidly improve energy efficiency and develop renewable energy, which is only possible with the support of the European Union. Russia has expressed doubts about the legitimacy of the KP amendment already in Doha. In contrast to Ukraine, Belarus and Kazakhstan, Russia with its hefty cushion of quotas and opportunities to reduce emissions is unlikely to be talking about the threats of the amendment to the economic development of the country. If the investment component were really interesting for our country, the refusal to user the opportunity to implement JI projects would be unlikely. Belarus and Kazakhstan, in contrast to Ukraine and Russia, do not have hefty "safety cushion" in the form of quota residues from the first period. These countries will hardly achieve emission levels below 2008-2010. It is this fact that can turn them into potential "violators" of the "Doha" amendment. Participation in the Kyoto Protocol, according to experts, is good for them mostly in terms of international processes that are not directly related to climate, rather beneficial for the image of these countries and for possible partnership support. Therefore, it is likely that Kazakhstan and Belarus will join Russia and will participate in the Protocol without commitments. According to media reports, Kazakhstan, as it was planned, was the first among the CIS countries to launch on 1 January 2013 the national emissions trading system, which includes 178 companies. Belarus is going to start a pilot version in 2014. It is unclear, what will happen to carbon markets in these countries due to the difficult situation during the second KP period. According to experts, the protest of "the group of four" against the amendment to the Kyoto Protocol is unlikely to affect the overall result. The Kyoto amendment will enter into force after ratification by ¾ of the participating countries. According to representatives of environmental NGOs, our countries shall remember not only economic preferences, which can be obtained from the climate agreement, but its more important mission - reducing greenhouse gas emissions to decrease effects of climate change on the environment and the humanity.